"A Dyin' Breed" is a solid gold Cowboy Country record. From ranchers to rodeo cowboys, a Dyin' Breed captures the life. 11. Where Have All The Cowboys Gone? Outstanding voice, really fine music, you wanna hear more and more. Keep on the good work, Royal. Goodbye Garth, Alan, Tracy etc. Every American gun owner should have this CD , to remind them just what freedoms we have in this country. Our rights are being taken away every day by some libural who thinks owning guns is the problem ,legal gun owners are the only way we stay safe , all other countries know this and do not want to wake the sleeping giant. Wade make me proud tobe and America. Wow! Sure will order his other albums in near future. This country music really seems to be of a dyin' breed. But for now it's still here and King Kimes is here to proof it! Keep up the good work. Really awesome! Great CD! As good as it gets. I play this guy regularly. 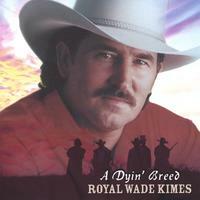 I have listened to all Royal Wade Kimes CD's as advertised by CD Baby, and I can't make up my mind which one I like the best. They are all superb. I will certainly be looking out for new releases regularly. I have been a fan of Marty Robbins for many years and I thought no one could be as good as him, until now. Thank you Royal Wade Kimes.